Apple did spark new markets but now Android/Linux on dozens of products is poised to overtake the iPad in units shipped. Android/Linux shipped on 1/3 as many tablets shipped as iPads in Q2 of 2011 but it is expected that Android/Linux will ship on 1/2 as many devices as iPad in Q3. 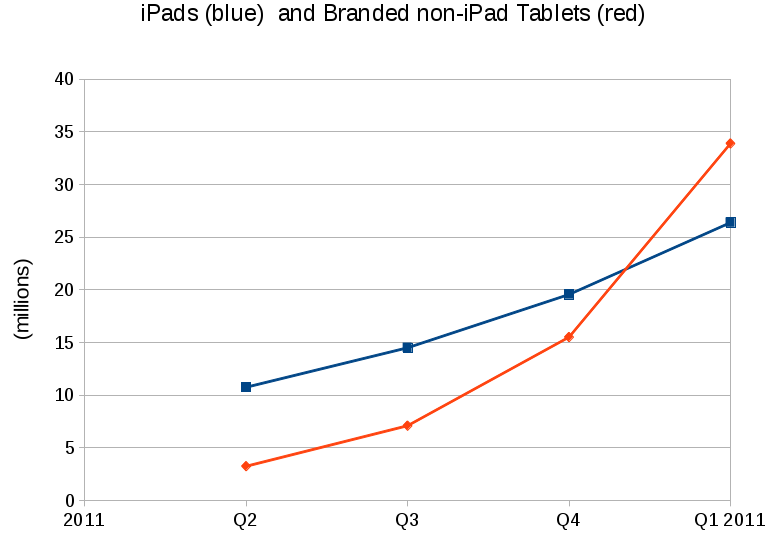 At this rate, the iPad will be overtaken in the Christmas rush or at the latest, in Q1 of 2012. This estimate does not consider non-branded or “white box” tablets of which millions will be shipped with Android/Linux. This is what has been promised since this time last year. The delays with Android releases and shortages of components are getting out of the way of the deluge. Apple will sink or swim. They will likely release iPad-next soon but the diversity of the Android ecosystem probably has that covered already. Choices come from freedom and sooner or later everyone will realize the real benefits. People enjoy the choices that OEMs were allowed to exercise with Android. Eventually, all users will demand more than a choice of bezel color. No one really likes restrictions, vanishing media or applications that spy on their private documents and conversations. It takes billions of dollars worth of advertising to push non free software. As the money goes out of it, so will the brainwash. I don’t know whether the attraction is freedom, per se, but choice. There are so many choices of ISP, telco, CPU, features, apps, size, shape, resolution,…. It’s just that not everyone loves Steve Jobs’ view of what’s perfect. I would not give Apple so much credit for the ARM market. Palm really created the market back in the late 90’s. Microsoft crushed that with a patent attack on graffiti and an OEM/retail attack on vendors that killed things by flooding the market with really bad Windows PDAs. Out of those ashes rose handhelds.org, familiar linux, OpenZaurs and others that proved the portable computing concepts with gnu/linux. Apple’s main contribution was to offer the RIAA and telcos locked down platforms that worked better than Windows without threatening their primary customer’s business models too much. Now that handheld platforms are so established that only complete trolls like Contrarian could doubt them, people are starting to demand their freedom with them. This freedom is why Android has risen so quickly. No one likes jails of the sort Microsoft and Apple build.